May | 2012 | The first beach bar in the great town of Khanom, South Thailand! Just become available. Beautiful mountain view plots in Khanom. Close to Khanom town and shopping area. Private access road with Electric and water. 4 lots currently for sale at 600,000 THB. Viewing highly recommended. 400 sqm. Ideal for you r holiday home or for rental properties. 16 Teams will be represented in the Samphan Cup Beach Football event, sponsored by Samphan Chrity, Beer Singha, Hadthip Coca-cola and CC Beach bar. 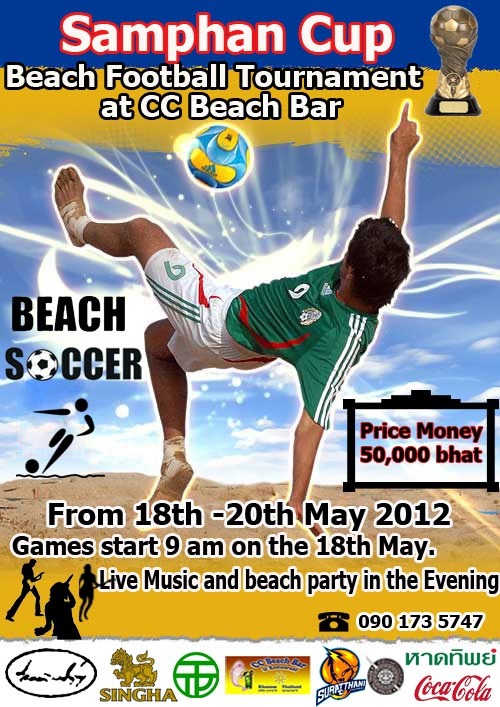 The games will be played on the Nadan Beach in Khanom at the CC Beach Bar complete with match officials, score board and crowd areas. The competition will take place on Friday 18th May to Sunday 20th, with matches being played through the days from 9am to 6pm. The Final will begin from 3pm on Sunday 20th May. The winning team in the Beach Football Tournament will be awarded their trophy and price money at CC Beach Bar Khanom on Sunday 20th. There will be food and beverages available throughout the day. Live music and beach party in the evening on all three days of the competition. So come on down and support your local team and have a BALL.